Two closely related pottery bowls on our website typify a type of pottery marking the all important transition from the later Hellenistic period to the time of Roman dominance, even before the formal establishment of Rome’s empire, of the broader Mediterranean world. Both bowls are examples of what is generally termed Megarian Ware, a type of pottery produced mainly in Greece and Asia Minor but also with imitative production centers in Italy. Megarian Ware, the name of which comes from 19th Century finds of this pottery near Megara in Greece, offers important insights into the transition from the ubiquitous red figure “painted” pottery of the classical era to the red slip pottery that would come to dominate the Mediterranean world for centuries to come. Both are thin walled bowls and made from fine hard pink clay. One is covered in a deep orange-red slip, the other in a chocolate brown slip. But the most important distinguishing characteristic of both, and of most Megarian Ware, is that they are mold-made, resulting in an all-over pattern of rosettes, laurel leaves and repeating geometric shapes in high relief. The different color slips used on these bowls is an important factor in understanding the role of pottery in the Hellenistic to Roman Imperial transition. Establishment of a relatively uniform Hellenistic material culture across a great geographic expanse, from South Italy and Sicily in the west to Syria and Mesopotamia in the east, led to the decline of the classical red figure pottery tradition. Potters turned to the mass production technique of stamping out vessels in molds. Some of these featured complex mythological scenes, such as this example in the Metropolitan Museum of Art in New York: http://metmuseum.org/collections/search-the-collections/254263. Dark brown and black slips on Megarian vessels offered a smooth transition from the attractive black slip wares of the later Classical era. A great deal of black to dark brown slip Megarian Ware pottery has been found in Republic level excavations in Rome and its colonies. The orange-red slip examples eventually came to dominate the market and provided the immediate inspiration, at least in color and fabric, for the fine, hard Roman red wares developed in Gaul and Northern Italy in the late Republic. 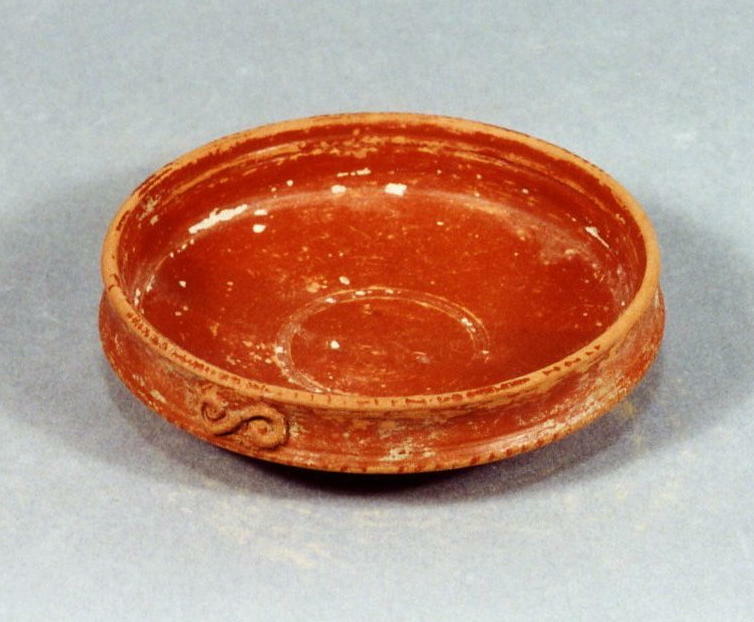 These would “spin off” countless imitations at workshops all over the Mediterranean world, finally concluding with the red ware of Roman North Africa in the 3rd, 4th and 5th Centuries.